August was a significant month for astronomy in Hermanus. On 10 August, the Mayor, Nicolette Botha-Guthrie, hosted a function attended by Councillors and other senior municipal officers, heads, science teachers and some learners from several Overstrand schools, representatives of the ASSA, HAC committee members and chair persons of other local organizations including Rotary, and the Botanical Society. Presentations at the gathering included the public announcement by John Saunders that Hermanus is now an integral part of the astronomical map following the re-naming of Asteroid 260824 as Asteroid Hermanus, only the second place in South Africa, after Pretoria, to have an asteroid named after it. A framed official framed certificate from the international Minor Planet Committee was presented to the Mayor. Two framed certificates of Honorary Membership of the HAC were also presented. Dr Amanda Gulbis provided invaluable assistance in establishing our link with the MONET telescope in Texas, and in securing the renaming of the asteroid. Committee member Steve Kleyn, a founder member of the Centre, donated the telescope which kick-started the observatory project, provides invaluable support in his role as technical adviser, and is currently designing two sundials which well be erected in Swallow Park. Pierre de Villiers also gave a presentation outlining the wide range of educational opportunities which the Centre offers to its members, the general public, and learners in the Overstrand, the latter including the MONET project, currently unique to Hermanus in the southern hemisphere. The mayoral function was reported in the 18 August issue of the Hermanus Times, and the 25 August issue included an article on Steve Kleyn, focusing particularly on the exacting work he does on building telescopes. Apart from its well-known shape, two other features are visible in the Southern Cross constellation. The Jewel Box cluster (NGC4755) is located just to the left of the star which forms the left end of the short axis of the star (at this time of year, at around 20.00, it is just above the vertically positioned short axis). Although visible to the naked eye, its multi-coloured beauty is best observed with binoculars. The Coalsack nebula, found in the South-west quadrant of the cross, is a large cloud of dust which blocks the light from the stars behind it. On 4 August, Cliff Turk from the ASSA in Cape Town gave a lively and very informative talk on the wide range of useful observations which can be made and reported by amateur astronomers. Cliff outlined a set of practical guidelines informed by his own extensive personal experience of undertaking such observations. These included: simple, but effective techniques and low-cost short-cuts to enable quick, reliable setting up of equipment, undertaking observations within the scope of the equipment, making detailed records of observations for reporting to the ASSA, and confirming sightings before reporting them. There are a large number of features which can be observed, depending on access to appropriate equipment, including the Moon, the Sun, planets (features & moons), transits, occultations, comets & meteors, variable stars, and deep sky objects eg. galaxies, double stars. The annual Sky Guides contain the names and contact details of relevant people who can be contacted for support and guidance, depending on your area(s) of interest. Viewing of the final episodes of excellent the DVD series on cosmology took place at the Cosmology group meetings. 19 and 20 people attended on 1 and 15 August, respectively. Parts 3 and 4 of the ‘Wonders of the Solar System’ DVD demonstrated how popular this series has been., with 15 and 20 people attending the meetings on 15 and 22 August, respectively. The final part ‘Aliens’ will be shown on 29 August. On 11 August, Johan Retief gave a presentation on the Solar System and Milky Way to twelve Grade 7 learners at Hermanus Waldorf School in Sandbaai. The children were attentive and enjoyed the interactive event. Some demonstrated existing knowledge, which was encouraging, as astronomy is not part of their non-mainstream curriculum. The August gatherings attracted approximately 20 people on the 5th, and 10 on the 6th. John Saunders’ article on ‘Eclipses’ which was published in the August/September issue of the magazine, was inspired by the lunar eclipse on 15 June. Monthly centre meeting On 1 September, Dr Lee-Anne McKinnel, MD of SANSA in Hermanus, will be giving a presentation which will include material on space science and SANSA, space weather and the ionosphere. It will be interesting to find out about what goes on in the building in which we hold our astronomy meetings. Interest group meetings The Cosmology group meets on the first and third Monday’s of every month. The three-part DVD ‘Atom’ will be shown during the next three meetings to be held on 5 September, 19 September and 3 October. Each lasting one hour, Part 1 ‘Clash of the Titans’ looks at the early days of exploring the atom, Part 2 ‘Key to the cosmos’ outlines how our quest to understand the atom unraveled the history of the universe, and Part 3 ‘The illusion of reality’ considers how studying the atom forced us to rethink the nature of reality. This excellent series supplements some of the material covered in the ‘Cosmology’ series. Meetings will take place SANSA at 7.30 pm. Star-gazing will take place on Friday 2 September and Saturday 3 September at Gearing Pint, from approximately 7 pm, weather permitting. It is offered, free or charge to everyone, members and non-members. The next meeting will take place on 10 October. Details will be circulated during September. (Signal Hill, the Planetarium and the Observatory) Places are still available. Please contact John Saunders on 028 314 0543 or at shearwater@hermanus.co.za for more information. The environmentally sensitive Educational Centre and Observatory has been designed so as to have as small a footprint and as low a profile as possible, and to blend in with the natural local fynbos. It consists of three elements. The circular hall and education centre, which will also be used for HAC monthly meetings, will be constructed within two fynbos covered berms which will disguise the building. The amphitheatre, to be located on top of the hall, will be used for star-gazing and daytime astronomy activities. Nearby, the observatory, with a slid-off roof, will house the Centre’s telescopes. The plans can be viewed on the Centre’s website. Please contact a committee member for any further information. The draft lease agreement has been submitted to Overstrand Municipality and work is beginning on raising the funds necessary for construction. Scientists using data from NASA’s Wide-field Infrared Survey Explorer (WISE) have discovered six “Y dwarfs”– star-like bodies with temperatures as cool as the human body. Y dwarfs are the coldest star-like bodies known, with temperatures that can be even cooler than the human body. Astronomers hunted these dark orbs for more than a decade without success. When viewed with a visible-light telescope, they are nearly impossible to see. WISE’s infrared vision allowed the telescope to finally spot the faint glow of a half dozen Y dwarfs relatively close to our sun, within a distance of about 40 light-years. The Y’s are the coldest members of the brown dwarf family. Brown dwarfs are sometimes referred to as “failed” stars. They are too low in mass to fuse atoms at their cores and thus don’t burn with the fires that keep stars like our sun shining steadily for billions of years. Instead, these objects cool and fade with time, until what little light they do emit is at infrared wavelengths. On 16 July 2011, Spacecraft Dawn went into orbit around Asteroid Vesta (second largest in the asteroid belt) and has sent close-up images made during the final approach with some big surprises. There are huge grooves around the asteroid’s equator. These grooves may have been formed by an ancient impact thought to have created a very large crater at Vesta’s south pole. The probe has also revealed some mysterious dark streaks inside some craters. The orbiting Herschel telescope has detected molecular oxygen close to the Orion nebula. This is the first time molecular oxygen has been detected in space. ESO’s Very Large Telescope captured this striking view of the nebula around the star cluster NGC 1929 within the Large Magellanic Cloud, a satellite galaxy of our own Milky Way. 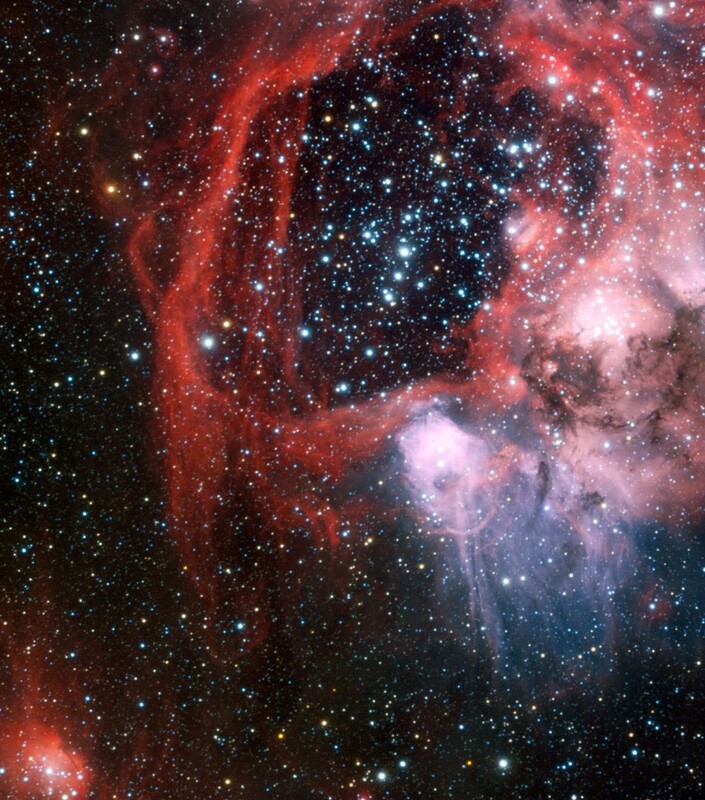 A colossal example of what astronomers call a superbubble dominates this stellar nursery. It is being carved by the winds from bright young stars and the shockwaves from supernova explosions. The Large Magellanic Cloud is a small neighbouring galaxy to the Milky Way. It contains many regions where clouds of gas and dust are forming new stars. One such region, surrounding the star cluster NGC 1929, is shown in close-up in this new image from ESO’s Very Large Telescope. This nebula is officially known as LHA 120–N 44, or just N 44 for short. Hot young stars in NGC 1929 are emitting intense ultraviolet light and causing the gas to glow. This effect highlights the aptly-named superbubble, a vast shell of material around 325 by 250 light-years across. For comparison, the nearest star to our Sun is just over four light-years distant. The N44 superbubble has been produced by the combination of two processes. Firstly, stellar winds — streams of charged particles from the very hot and massive stars in the central cluster — cleared out the central region. Then, massive cluster stars exploded as supernovae creating shockwaves and pushing the gas out further to form the glowing bubble. Although the superbubble is shaped by destructive forces, new stars are forming around the edges where the gas is being compressed. Like recycling on a cosmic scale, this next generation of stars will breathe fresh life into NGC 1929. Although including several un-manned missions, mostly Kosmos satellites, Soyuz was fundamentally a Soviet human spaceflight programme. Started in the 1966, its purpose was to rejuvenate the Soviet space programme, which had begun to fade. It was originally part of a Moon landing programme which aimed to put a man on the Moon before the Americans did. However, this goal was never achieved by the Soviets, although Soyuz has proved to be an enduring programme, containing several more ‘firsts’. The very successful Soyuz rocket, originally designed to launch the Soyuz spacecraft, continues to be used, and is now used to launch un-manned progress supply spacecraft to the International Space Station, as well as commercial launches. The earliest Soyuz spacecraft were intended to travel to the Moon without employing massive booster rockets like the Saturn V. This would be achieved by repeatedly docking with upper stages that had already been placed into orbit. The basic spacecraft consisted of 3 parts – an orbital module, a small re-entry module and a service module with solar panels attached to it. A number of derivatives of the Soyuz spacecraft were developed. Some were unsuccessful, but others include the Progress un-manned cargo craft used for the Salyut and Mir space laboratories, and the spacecraft currently used to transport personnel and supplies to the International Space Station (ISS). Soyuz 1, launched in 1967, was the first manned mission of the programme . Aiming to make the first docking with another spacecraft, Soyuz 2, the ‘first’ for this mission was an unwanted one: the first in-flight fatality. Despite numerous design and engineering faults being identified by technicians, appeals to party leaders to postpone or cancel the launch were ignored, possibly due to a desire to mark Lenin’s birthday with a launch, or possibly to take advantage of the US setback following the Apollo 1 disaster. The mission was fraught by mechanical problems and malfunctions from the start, and was aborted after 1 day. However, problems persisted, with the landing parachute failing to open. The capsule fell to Earth at 140 km/h, exploding on impact and killing the cosmonaut. It had been planned to launch Soyuz 2 to try to repair some of the faults on Soyuz 1 while it was still in orbit, but it was not launched, possibly because it had similar mechanical problems. The Soyuz 1 disaster delayed subsequent missions for 18 months, probably scuppering Soviet plans to land a man on the Moon. Although practicing manoeuvres preparatory to docking. Was asserted to have been the purpose of the re-engineered Soyuz 2 and Soyuz 3, launched in 1968, documentation has identified that these two craft had been meant to dock. After three failed attempts by Soyuz 2 and 3, the first manned spacecraft ever to dock in space, enabling cosmonauts to transfer between craft, was finally achieved by Soyuz 4 and 5, early in 1969. Although not part of the US system, a Soviet Moon landing would have required a docking and transfer of cosmonauts between modules, hence the focus on this activity. Having been beaten to a Moon landing by the US in July 1969, the joint missions of Soyuz 6, 7 and 8 was the first time 7 crew members were in space at one time. However, equipment failures meant that the missions failed in their primary purpose of Soyuz 7 docking with Soyuz 8, the process being filmed from Soyuz 6. This failure was possibly the final nail in the coffin of the Soviets plans for a lunar landing. The nearly 18-day endurance flight record achieved with Soyuz 9 was an important step in paving the way for the first space station mission, Salyut. Findings regarding the effects of prolonged weightlessness on the human body were particularly important. Launched in 1971, Soyuz 10 was the first manned mission to the first space station, Salyut 1. However, it was unable to dock fully and the mission was aborted. Although Soyuz 11 was the first mission to successfully dock with the space station, enabling the cosmonauts to remain on-board Salyut 1 for a record 22 days, unlike the successful return to Earth of Soyuz 10, the 1971 Soyuz 11 mission ended in disaster when the 3-man crew died following a sudden, unplanned depressurisation of the capsule before re-entry. This disaster resulted in the only human deaths to have occurred, so far, in ‘real’ space (beyond Earth’s atmosphere). Following this disaster, the Soyuz spacecraft was redesigned for only 2 crew, the extra room enabling them to wear space suits during launch, docking and return. Launched over 2 years after the Soyuz 11 disaster, Soyuz 12’s purpose of docking with a space station was not possible due to failure of the Salyut 2 station and its planned replacement (DOS-3). This meant that the purpose of Soyuz 12’s 2-day mission became to test the redesigned craft and its improved crew-safety features. Soyuz 13, also a test flight of the upgraded Soyuz spacecraft, was also the Soviet’s first dedicated astro-nomical science mission, carrying the Orion 2 Space Observatory onboard. In 1974, Soyuz 14 docked with space station Salyut 3, the first completely successful mission to space station by the Soviets. In contrast, Soyuz 15 was unable to dock, and the mission was abandoned. Launched late in 1974, the Soyuz 16 mission was the final rehearsal and first manned mission in a programme which culminated in the 1975 joint Apollo-Soyuz mission. The latter was a symbol of the détente which had included several arms controls treaties. The cosmonauts on Soyuz 16 tested the planned docking system, as well as other modifications for the link-up with Apollo. Soyuz 19 formed the Soviet part of the first joint US-Soviet space flight in 1975. Although both crews undertook some scientific experiments, some astronomical, the primary purpose was symbolic, and it ended the tensions of the Space Race. As with earlier missions, Soyuz 17 and 18 had linked up with a Soviet space station. Missions subsequent to Soyuz 19 have also largely had the purpose of docking with space stations, both Soviet/Russian eg Mir and joint ventures with the US eg the ISS. Soyuz has proved to be the longest-lasting space programme. Since the launch of Soyuz 1 in 1967, more than 107 Soyuz spacecraft have been launched, and several continuing future missions to the ISS are planned.